Receive three bottles of our delicious mead quarterly for $79.80, plus tax (where applicable) and shipping. That's 5% off standard online pricing! Receive six bottles of our delicious mead quarterly for $151.20, plus tax (where applicable) and shipping. That's 10% off standard online pricing! limited to first 10 customers only! Receive twelve bottles of our delicious mead quarterly for $302.40. That's 10% off standard online pricing! 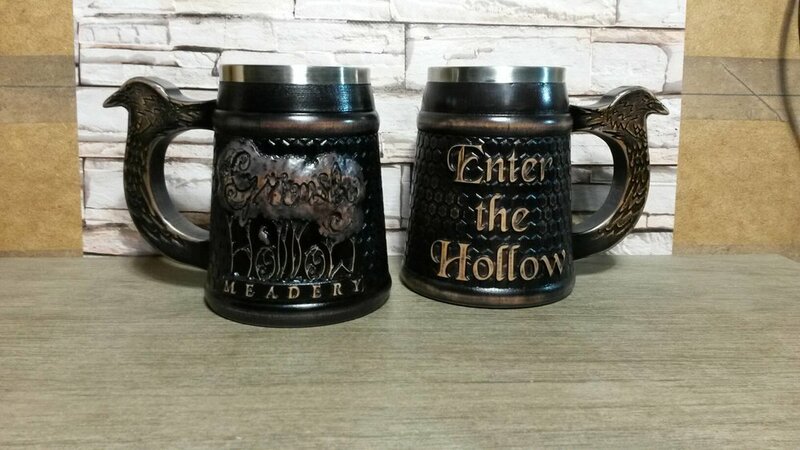 Exclusive, numbered, wood-carved Grimsby Hollow mug, with stainless steel lining. this is your wayward souls club mug, you're just receiving it before anyone else! LIFETIME membership in Wayward Souls Mug Club once our tasting room opens. This is valued at $75 per year! NOTE: Tasting room is not yet open. The Wayward Souls Club perks will not be in effect until that point. This version of the VIP club will be limited to the first ten members, and then closed forever. Want to save on shipping? Bottle club orders may be picked up from the meadery. Pick ups must be made within two weeks of release.